I. 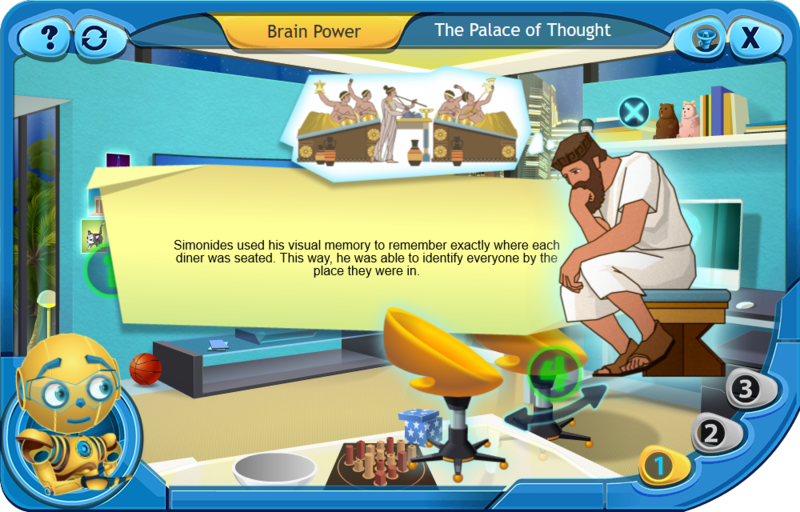 What is the Palace of Thought Memory Technique? The Palace of Thought or sometimes called Loci Method is a fun and popular memory technique used at times… wait for it… to learn entire books! Impressive, isn’t it? Let’s start slow though. If you want to memorize lists, classifications, names, objects, in a certain order, you can with this mnemonic device (fancy talk for memory technique). The Loci method is a visual tool that connects familiar places with new information. In other words, we associate what we need to learn with places that are already well memorized. When starting with this techniques, it is best to rely on the places you know by heart: the house you live in, your bedroom, the way towards school if you are a kid or work if you are an adult. It is not uncommon for those that are experts in this technique to create vast mental palaces with thousands of loci (places) to be used for memorization. It is really a great memory tool. The following is an applied example of the method. This is used to teach kids the order of the planets (Solar System), starting with the one closest to the Sun. There are 3 steps to perform, we will detail them one after the other. The best thing to do to treat everything like an elearning for kids game. Make it fun, interactive, provide lots of visual, auditory and tactile stimuli. Let’s do it. What you will do first is memorize a natural path through your house, in this case from entrance to bedroom. You need to have 8 pit stops. Why 8? There are 8 planets in the solar system. - We begin with the door entrance. Look at it with your mind’s eye. This is pit stop 1. - Unlock the door and move further. You are in the hallway. Look at something you usually interact with (example: clothes hanger) when you enter and make this pit stop 2. - Move towards the kitchen, enter it and look inside the refrigerator. That is pit stop 3. - Next, move to the oven, look at it, something is cooking there. Make that something pit stop 4. - Go to the sink and look inside it. This is pit stop 6. - Exit the kitchen and go to livingroom. Look at the couch, see it with your mind’s eye. That is pit stop 6. - Go to the bathroom and look at the toilet seat. This is pit stop 7. -Last, go to your bedroom and look at the bed. That is pit stop 8, the final one. There you have it, step 1 is complete. Associate each letter, in order, to the pit stops (in order.). One letter per one pit stop. The secret here is to focus on visualizing each first letter at each pit stop. Make it a game of weirdness. It must be fun. - At the entrance, visualize the letter M blocking the door. Remember, the mind works great with associations. Make the “M” metallic. This is Mercury. By giving it details you improve the chances of remembering it. - Go to the hallway, look at the clothes hanger, visualize the letter “V” hanging from it. - Move to the kitchen, look inside the refrigerator, you can see the letter “E” frozen. That is poor Earth. - Yummy, we are moving towards the oven, something nice is cooking, it is the letter “M”. Now, to make it weird, imagine the texture of the letter as chocolate brown (like the Mars Candy Bar). Why would anyone cook a mars candy bar? - Move to the sink, the letter “J” is taking a shower there. - In the livingroom, you can see the letter “S” just chilling on the couch, shhh, don’t wake it up. It could bite. - Moving to the bathroom, you can see the letter “U” sitting on the toilet seat. The letter is naked! Shut the door quickly. “U” is from “Uranus”. You’ll remember this forever. If it is shocking, it will be remembered. - Go to your bedroom, here you can relax. Visualize the letter “N” floating on the bed like it would in water. Neptune was the god of the sea after all. This was step 3 and the final one. That is all! If you imagined it, you most certainly memorized it. Now you know the order of the planets. How cool is that? Just to be sure you will remember the order for a long time, go through the pit stops again. What are you waiting for? Go test it out now! Want to learn more? 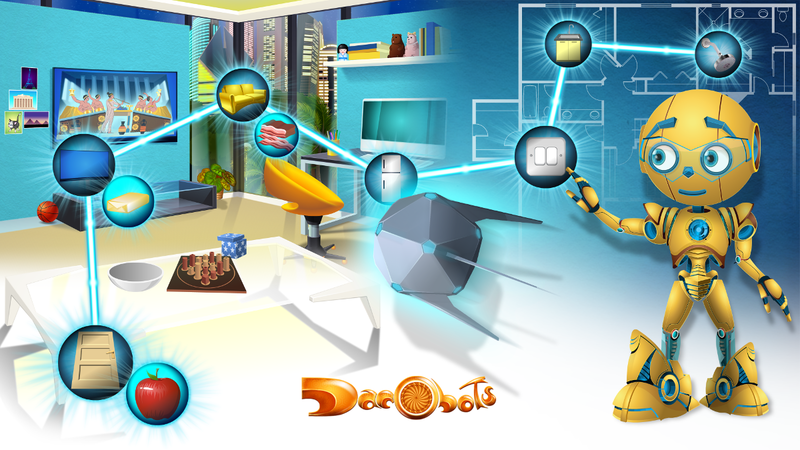 Check out the elearning games in the Brain Power Series here Dacobots Portal.